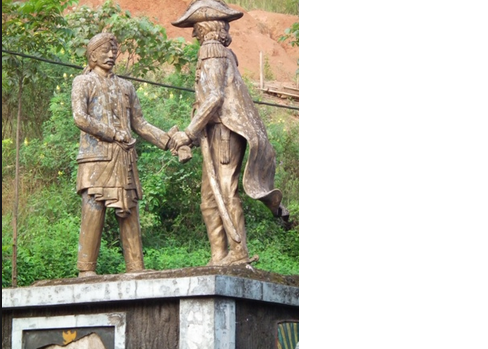 Statue depicting two figures known as the leaders of Prince Kornel can now also be seen in campus of University of Winaya Mukti of Tanjungsari, precisely on the Bojong Seungit hill. This statue is a transfer from Cadas Pangeran site (Prince rock). I do not know what the reason Sumedang Regent to replace the statue with a greater statue similar to the former. The former statue is smaller, now preserved in Unwim campus. In the history told that the Governor General of the East Indies in 1808-1811 was Herman Daendels Wilem. Governor-General had initiated the development of a post road from Anyer to Panarukan starting in 1808. Giant project undertaken by the colonial government. Now we feel the magnitude benefit of the road. What is unique of sculptures that can be seen by the passerby Bandung-Cirebon road or the student of UNWIM. Which is not common is the handshake position, the two hands are at the same right position of the Governor or the same left side of the Prince. For the Easters left hand is something bad or unwiseness. project. It is reasonable one protested his leader over unwise policy and is not fair to his people. We are proud to have a leader who is brave. Perhaps the reason of Sumedang Regent wishing to show the audience and passerby that Prince Regent of Sumedang, West Java was dare and brave to fight the Governor. However, when Dutch come to Sumedang and see the statue, they will also feel proud to see their general sculpted as a statue in the land of Indonesia. They will be proud of theirself "I was a knight race". We use the right hand for handshake marking in goodwill. while the Prince held keris/knife by right hand signing brave... ?